Hmm, what to choose? A tribal design? Asian characters? An arm-band? Yaaarrrr. Anchor tattoos are cool, especially if you’re like my grandfather when he was a kid and you gave one to yourself using a bottle of ink and a safety pin. Popeye chic. This little nautical design is awesome because it is the exact opposite to the very worst tattoo that I have ever seen in my life: the Tasmanian Devil wearing a Calgary Flames jersey. This entry was posted on May 20, 2009 at 5:51 pm and is filed under statements. You can follow any responses to this entry through the RSS 2.0 feed. You can leave a response, or trackback from your own site. A friend of mine wanted to tattoo a message in Spanish (she’s nuts about Spanish/Mexicans!) just under her clavicle for everyone to see. She thinks that’s cool, but I think that’s a little too… “up-front”. I’m getting an anchor tattoed on both of my shoulderblades. I’ve been sticking with the nautical theme. 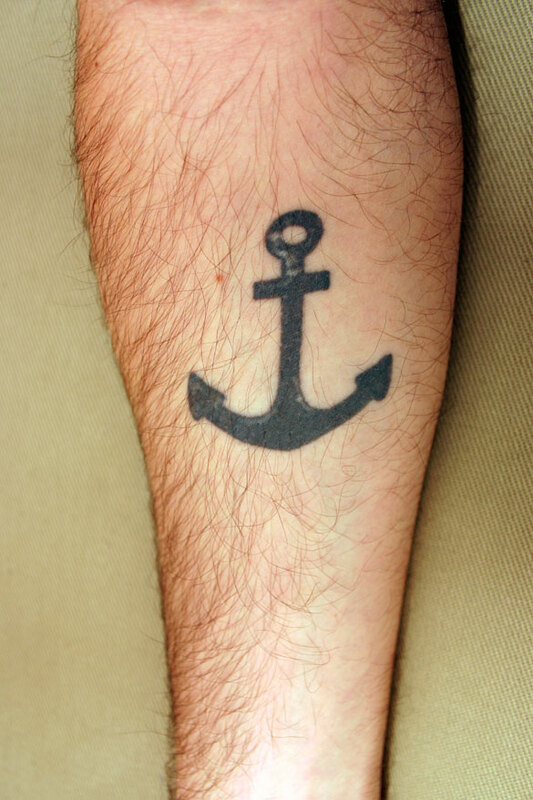 I think people with nautical tattooes are the ultimate defenition of cool LIKEOMG. I was loving this blog until your dissed the Calgary Flames. I may live in Vancouver now, but I grew up in Alberta and will always be a flames fan. Seriously though, I love your blog. Hahaha, it’s not so much a dis of the Calgary Flames as it is a dis of Looney toons tattoos. Since we’re on the topic, though, God I hate the Flames! Have you ever tried to watch a Canucks vs Flames game at a bar in Calgary? Insufferable! Incidentally, “Sticking with your team, even though they’re Hate-Worthy” should be on the cool list. Exceptional web page. Loads of handy data the following. I am submitting this to several buddies ans in addition giving within delightful. And positively, appreciation for your energy!